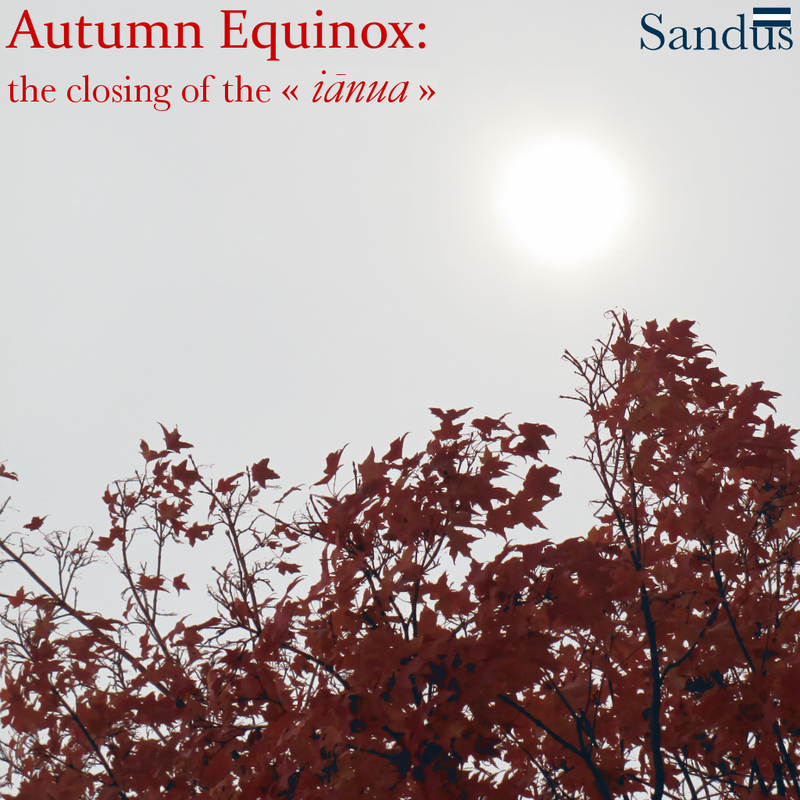 This Autumn Equinox marks the third anniversary of the establishment of the administrative seasons — a quarterly system to provide reflection and the reaffirmation of goals in the State of Sandus for the establishment of the Sandum Value in our civic life. This momentous system is one that has been firmly marked since this day three years ago. Despite what ever trials and tribulations in our lives, the equinoctes and solstices have always been faithfully marked events in the administrative life of our polity — we have always faithfully marked the passing of the new season, the preparation of a new part of the yearly cycle, and the celebration of the annual cycle itself. In this, the fifth year of Sandus and the third year of the regime under the State, we have even greater cause to celebrate what is to come. The fundamental changes in our state functions over the past summer and the growth of our abilities as a micronation have been portrayed by the events of Iunio (June) and Quintilo (July), events that saw the first public events in Sandus and the first visit by a visiting head of state — and the addition of the Kingdom of Überstadt as a socilivo. The creation of Erganê, the work of Tellus, and the reflection of Lammas were fundamental in the work of the State in this season but also in preparation for present and future work over the duration of the next season and seasons in the next annual cycle of the administrative year MMXV (2015). Our goals as a country have been clearly marked, our work as a people has been fervently done. In the next season, Sandus will also mark its third year of CCPS activity, foreshadowed by expectations of the previous season in Summer MMXIV (2014); Sandus will also mark its third annual election of the Sôgmô on the Winter Solstice, the culmination of the Autumn season. Our work in this season turns from external to internal — beginning to answer fundamental questions guiding the direction and velocity of our State. Now what remains is the continual progress of the Sandum nation-state that will persist as a light in the world. Each administrative holiday, we count up the practical work Sandus has done to benefit our community and those around us. This falls into the Sandum Philosophy’s desire for compassionate activity: that suffering exists in our world and that it requires the faithful work of individuals to combat that suffering. For compassion is the ideal of the Sandum Value and expressed in our national identity, we Sandum people have consistently strove to achieve this work faithfully. Part of our census makes direct note of this practice, where we celebrate, enumerate, and publish the compassionate work we have done over the past season. In this way, Sandus prides itself on the pragmatic and revolutionary work it does for philanthropy and for compassion throughout the world. In the past season, Sandum citizens have volunteered their time to churches and faith institutions, to labour at corporate bodies without pay in internships, and have studied and taught our various arts and expertises for the benefit of others. We have, to date, raised over $95.50 USD to benefit others and philanthropic causes directly. With all this work, we can certainly say that the value of the Sandum Philosophy remains strong — and that it serves as a light in our world. The system of Sandum citizenship — split between civilae, socilivae, and peregrae — has seen recent innovations not planned for by the Office of the Sôgmô: the blurring of the three citizenship designations and the expansion of the peregra order. By having the right to suffrage divorced from full or civila citizenship and, instead, dependent on the obligation of charity taxes (described above), the right to vote and stand for certain offices has been open up to all citizens of the State — not just full civilae citizens. With this, now socilivae can vote in national elections and referenda, and this can have greater impacts too. In the last Season, the Sôgmô has affirmed the rights of peregrae and socilivae to be represented by the Party — but also the rights of those two citizenship categories to speak and have representation in the CCPS Party Congresses. This innovation is unheard of: for now the rights of suffrage formerly restricted to the civilae by virtue of having no socilivae or peregrae has been opened up to all citizens under the right to petition by the Sôgmô’s actions. Furthermore, the designation of peregra citizenship has now been expanded. What was once a citizenship class that existed for those who had applied for citizenship and waited the customary month has now become the peregrae order of partial citizens who reside in Sandum territory. Whereas before one was a peregro for a month after applying to become a citizen (civilo), the definition of the term peregro has been expanded to include even those who have not applied for citizenship but know of Sandus, who are active non-citizen residents of Sandum territory, and who have been recognised by the Sôgmô as peregrae. In the upcoming Autumn season, however, significant reflections need to be made on the Kremlum Sandus State College to see if the college is adequate enough to provide education for citizens. At the moment, Sandum citizenship is highly restrictive: one must both wait a month for full civila citizenship but also attain a civila certificate from Kremlum Sandus State College — a certificate worth 12 credits of courses. The Party will assess whether or not this system works and should remain in place or is too restrictive and should be relaxed with the old requirement of waiting only a month restored. Over the past Summer, the economic work of the Sandum State has seen its positives and negatives. For the first time in the history of Tellus Agrarian Cooperative, a crop did not fail. However, the crop still did not see complete growth into radishes: but were a nice garnish on a salad! In this season, Sandus saw its economic unification with the rest of the Saint Josephsburg Economic Pact and the addition of its socilivanço of Überstadt. In this season, as well, Erganê Artisan Cooperative was established and founded. With these successes in the building of our socialist system, there were several drawbacks. Tellus’s crop did not fail, but it did not succeed either; Tellus also only had one crop, when in fact it could have done several more crop rotations throughout the season. Ultimately, our horticultural abilities must be strengthened and the resources we have for horticulture ought to be developed. Erganê was formed, but it has not been productive so far. The SJEP was established, but work has been slow — and Sandus’s dedication to the Pact has been minimal from a critical perspective. Finally, no overwhelming work has been done on the development of the Sandum socialist system. Although the Sôgmô learned of how Renasia applies its meritocracy to its economy and pledged to apply that to Sandus’s socialist economic plan entitled «All-Citizens United», no work has been done to that effect under his authority as Sôgmô or as Acting-Secretary. In the coming Season, the Sôgmô has vowed to accomplish work towards reforming the functions of the Party and towards establishing democracy and the Council plan in the State system. To this effect, the Party will join with the Sôgmô’s expected addenda to the «All-Citizens United» Plan (see above) and will see reforms made to the structure and function of the Party. For instance, the Party will see rebranding, changes to its official ideology, and the possible creation of a more dedicated and exclusive party membership. With these in work, they will be discussed at the fourth Party Congress — the date of which has been decided but has yet to be published by the Acting-Secretary. The introduction of proto-democracy is the important work here. Long has the Sôgmô promised a direct democratic Council, but never before have plans been drawn up. Now, finally, on the third anniversary of the promulgation of the Act on Democracy of September 2011 (Septembro MMXI), the Sôgmô has announced plans to extend democratic powers to citizens of all three classes and has vowed to consult with the People in a more democratic and transparent way in the future, in a way congruent with the formation and development of the Sandum republic. In the next Season, the Sôgmô will work to establish the Council plans and to work to cooperate with the Sandum “dêmos” more frequently and openly. In this way, the Sôgmô’s actions and desires will be ratified by the People and monthly sessions can be convoked to discuss and ratify those decisions, thus creating a monthly system of omnibus bills. It is frequently the desire of Sandus to reflect on its social activism and social work. In this way, Sandus can reflect and express in what ways it has benefited others and – especially – our citizens. In the past Season, Sandus has affirmed its belief in the role of social activism and social work. To this regard, Sandus has stressed its role this Summer season especially in regard to LGBTQ+ functions. In Été MMXIV (Summer 2014), Sandus has celebrate LGBTQ+ Pride Week in Iunio (June) on the occasion of the anniversary of the Stonewall Revolution (XXVIII Iunio, 28 June). In early July, Sandus met with the King of Überstadt, signed the treaty granting sociliva citizenship to Überstadt, and discussed the role of religion and spirituality in social work — especially for religious minorities that make up the bulk of Sandum culture and that Sandum citizens are a part of (Buddhism, Paganism, Mormonism, etc.). We have commemorated the function of peace and the end of the Great War on XXVIII Quintilo (28 July), the centenary of the beginning of World War I. On Chökhor Düchen, Sandus celebrated its history as a Buddhist micronation, heavily influenced by the Buddha’s works and his Dharma. On I Sextilo (1 August), Sandus commemorated the end of the Lethler era, a time period important for our State and reflected on the development of Sandus under the Party Year Plan MMXIV (2014) on Lammas. Around this time, as well, Sandus affirmed its belief in the right of individuality for trans* micronations to have their identities, names, pronouns, and other features of their individual persons to be respected in the intermicronational community at large; as a result, Sandus promulgated with Zealandia and several other states the Denton Protocol. On III Sextilo (3 August), Sandus celebrated the first anniversary of extending socilivanço to Kumano. On XXI Sextilo (21 August), Sandus mourned the anniversary of Hawai’i’s statehood in the United States, complicating forever its hope for renewed sovereignty and independence after the illegitimate overthrow of the sovereign Kingdom of Hawai’i. Finally, in Septembro (September), Sandus has commemorated the Day against Terrorism and Imperialism (XI Septembro, 11 September) and Sandus marks today, XXIII Septembro (23 September), Celebrate Bisexuality Day. Such have been the periodic work of Sandus for social activism and social work.